Wow, December sure has been interesting so far! I am running behind, as usual, so this week I am keeping things simple in the meal department. That way I can focus on the baking and shopping and wrapping and all the other stuff needing to be done. So, here is my simple, yummy, comfort food menu for the week. Tuesday: Bestest Hamburger Soup - I found this on Recipezaar and have been making it for quite awhile now. The whole family loves it! It is yummy and filling and just plain good! Perfect for a cold winter day...especially with corn bread or warm rolls. Wednesday: Meatloaf, green beans, crash hot potatoes, and rolls. Thursday: Three Cheese Chicken Penne Pasta Bake, salad, garlic bread. We had this pasta over the weekend and everyone requested it again. Looks like it's for sure a keeper! Friday: It's leftover buffet night! We will have leftovers from the week and work on more Christmas baking. 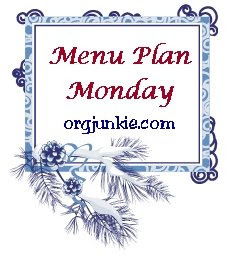 For more wonderful meal plans click the pretty MPM banner at the top of this post to check out MPM at Organizing Junkie. What do you have planned for the week? can't wait on tuesday night. yummy! i would love the penna pasta meal too. Mmmm that Hamburger Soup looks delicious! I bet that would do well in the crockpot too! Sounds yummy! When is dinner time, again?